Happy Health Information Professionals Week! 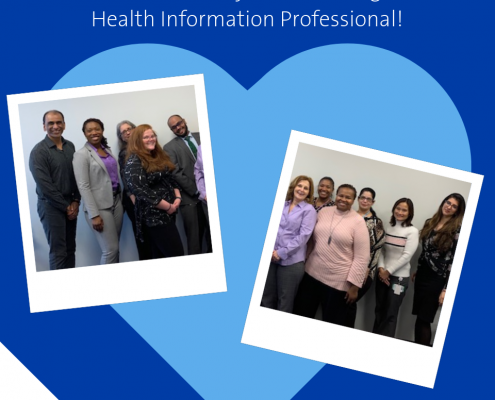 Today we’re celebrating the hard-working health information professionals who are a part of the Heath Information Management (HIM) team at Northwell Health. 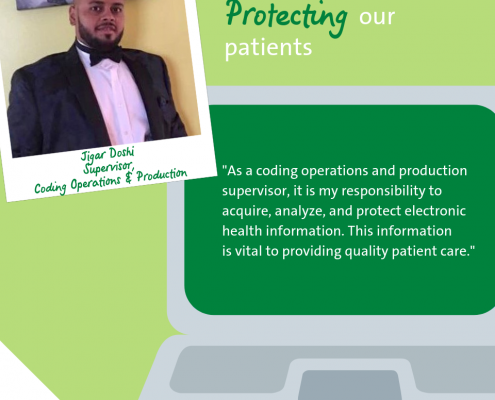 Our HIM team members work daily to acquire, analyze and protect patient medical information. With such an important job, there’s a lot to love about being a HIM professional! Check out our team members’ top seven reasons! The health information landscape is constantly changing as technology and applications advance. As health data increases, so do the possibilities for health information professionals. There are always new opportunities to advance your skills as a professional through education, state-of-the-art applications, and collaboration with other units within Northwell. Any information related to health conditions, quality of life, reproductive outcomes, and causes of death for an individual or population is classified as health data. Working as a health information professional allows us to analyze trends and ensure this aggregated health data is shared across our health system. By prioritizing health data, we’re helping to drive positive outcomes and experience. Working in healthcare means we as employees have the privilege of helping patients without working inside a hospital. Although health information professionals may never meet the patients directly, they are working hard to ensure that they are not only protecting the patients’ privacy but ensuring the accuracy of their healthcare information. A patient’s care doesn’t end when they leave a hospital. 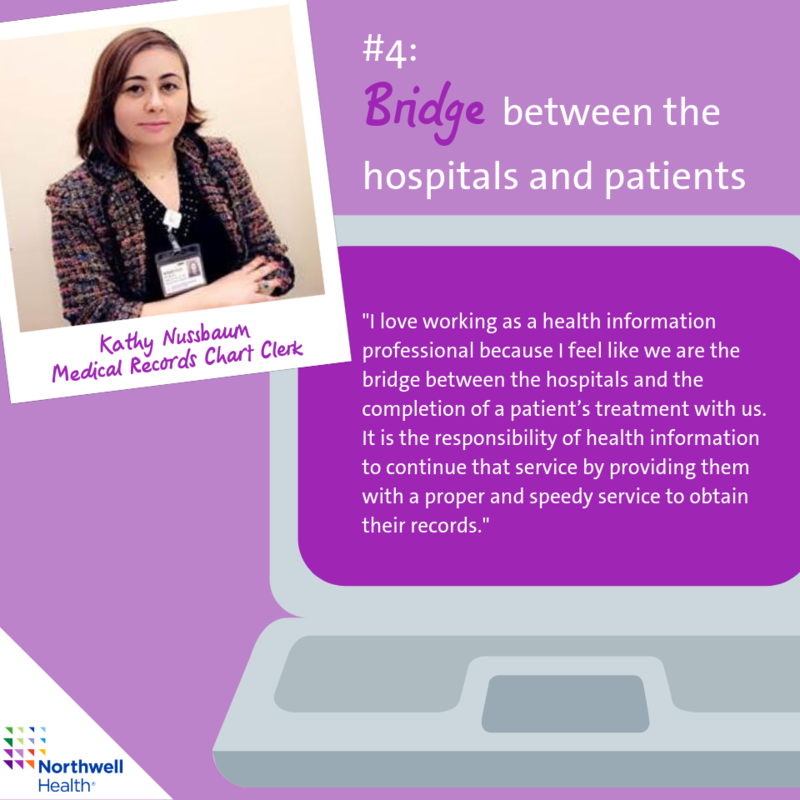 Collaborating with different units across our health system allows us to bridge a patient to their care. By helping patients get proper and speedy service to obtain their records, we’re helping the patient stay connected to the quality care they received through the completion of their treatments. 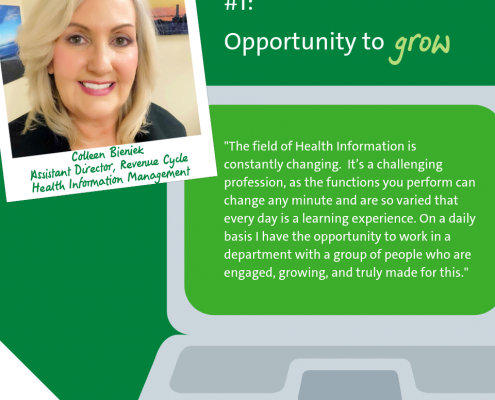 Educational opportunities are promoted by health information leadership who work hard to ensure our teams have the tools and skills they need to be accurate, compliant and successful. 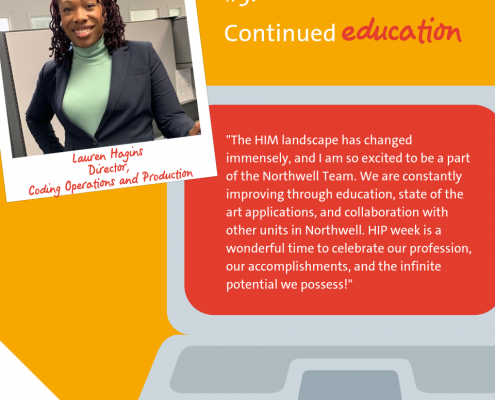 With the support to continue our education from leadership, including access to tuition reimbursement programs through Northwell, we’re able to grow with our growing industry. 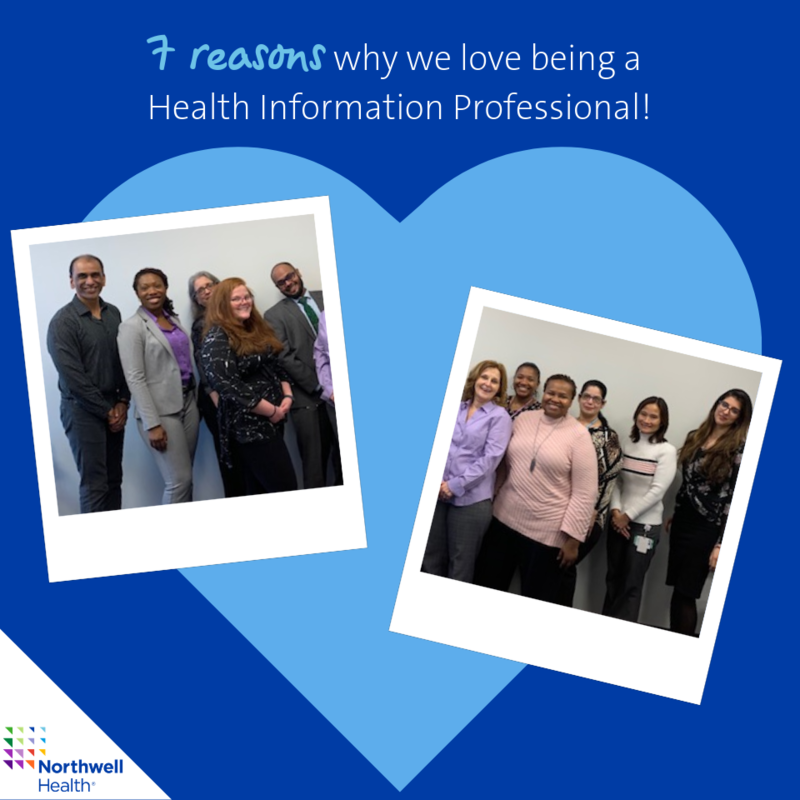 Health information professionals at Northwell aren’t just a team, we’re a family. Working truly together under the guidance of supportive leaders helps our entire team to succeed. 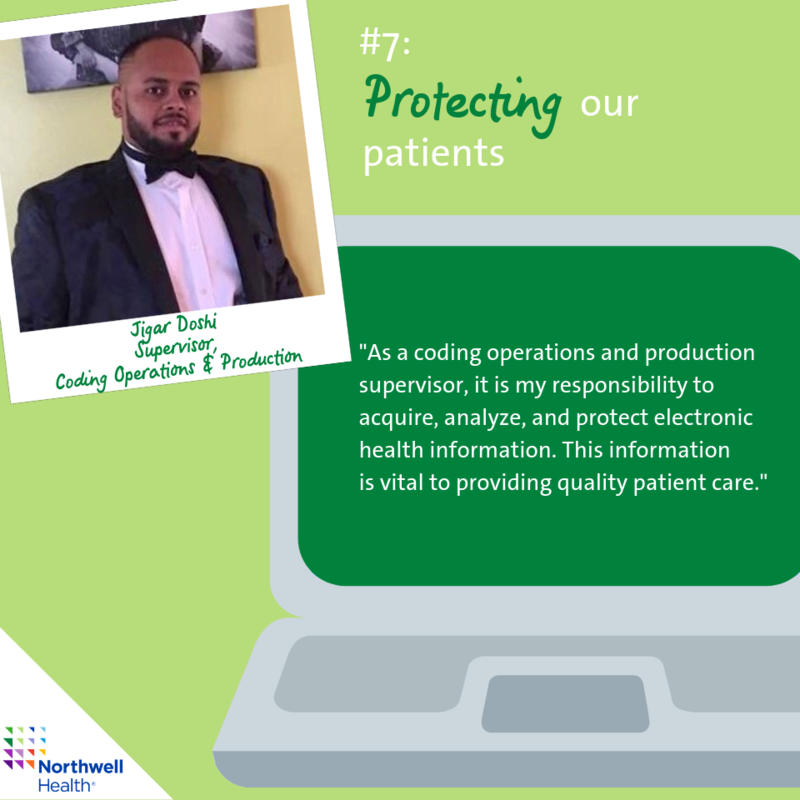 Protecting our patients goes beyond just ensuring data security, it’s protecting their care. As health information professionals, we ensure that the patient data is always accurate, secure, and available when they need it most. Northwell Health’s own Anthony McCallum, CPC-I, CIRCC, CPC, CCS received the 2018 Omar Brito Life Achievement Award from the Roxbury Institute for Medical Management in recognition of his extraordinary personal and professional achievements. Here’s how he got here. 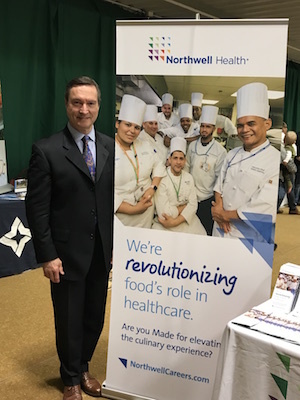 Find a career like Anthony’s at Northwell Health! 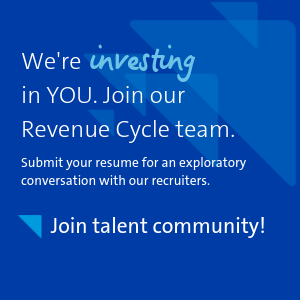 Learn more about our open revenue cycle positions here. The Clinical Coordination Center consists of experts who are capable of addressing the needs of a patient and coordinating their access to care. They take into account the urgency of patient needs, their location, physician availability, and many other nuanced factors that play into providing the best possible care. Clinical Coordinators work at the center of Northwell, gaining insight into nearly every aspect of the health system. It’s the sort of role that attracts high-level intellectual caregivers, and fosters collaboration. The results of this team have been astounding. Patient satisfaction is through the roof reaching a whopping 95%, and physician satisfaction is at 93%. The rewarding reception to the work being done at the Clinical Care Center is matched by a rewarding work environment. Clinical Care Coordinators benefit from a bright room, flexible hours, fun activities and, above all, a team of enthusiastic colleagues. As a Patient Care Coordinator, you will be the eyes and ears of the Clinical Coordination Center. As the first line of defense, you will triage patients to determine the next step in their care and what the patient needs. A minimum of three years clinical experience. Candidates with experience in careers such as, but not limited to, LPN, Medical Assistant, CNA, PCA, OR & ED Tech are encouraged. Looking to work beyond the bedside? Join a team where you will have an even greater hands-on approach to patient care. In this role, you will help take patients through their entire care journey from triage to referral to outcome discussions and future follow up visits. Grow your expertise of our world-class health system while guiding patients, physicians, and a multitude of other departments toward a more seamless health journey. At our first Inside Northwell Facebook Live session, we sat down with members of our Talent Acquisition team who gave the best tips for candidates looking to join our team in 2018. Check it out! 1. How can candidates stand out while applying for jobs in 2018? My best piece of advice would be to only apply to positions that you meet the minimum qualifications for. With the volume of applications we receive we can’t contact everyone and we are contacting only those who most closely match the department’s specific needs. If you don’t hear from us, you will remain in our database and we can contact you for other positions you are suitable for. Just because you were not the right match for one, does not mean you wouldn’t be the right match for another so don’t lose faith – the needs vary from department to department. 2. How can they make their resume stand out throughout the bunch/mix? Remember to add keywords. We have advanced technology that we are using to source through a variety of candidates. If you have the keywords within your resume our searches will be able to match with yours and pull up your information before someone else’s. Also, remember to send the final version of your resume. You wouldn’t believe the amount of resumes we receive with a coworkers/family members/metors edits on them. Always double check! If you’re updating your resume, as you should be all the time, make sure that any past experience is referred to in past tense. If it looks like current tense language for a position you held 3 years ago, we notice that and it shows less attention to detail. Also remember to quantify information. If you work for an organization that we aren’t familiar of, it’s very helpful to a recruiter to have some sense of how large that organization is, adding the number of direct reports (if any) you have, if you’ve saved the organization any money and how you achieved that – this will help us quickly understand who you are and what you do for what type of organization. 3. What makes a candidate “made for Northwell Health”? 4. What are the most appropriate ways for them to follow up with recruiters? 5. What is your last piece of advice for our candidates? 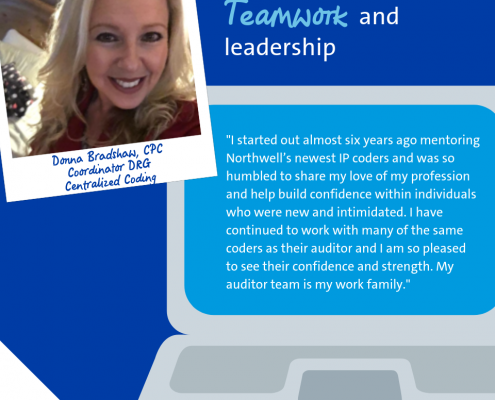 Check out our Inside Northwell page to learn more. 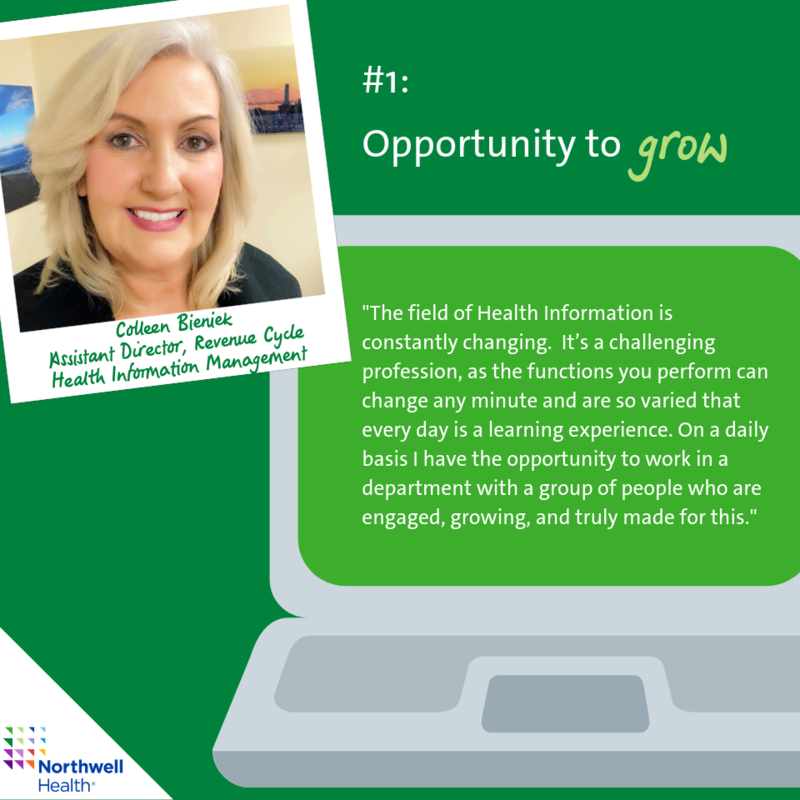 When I first started my summer internship at Northwell Health in the Healthcare Management Program, I thought I had a sound idea of what I wanted to do in my career. Being a science major, it made perfect sense to want to pursue healthcare from a clinical standpoint. I had no idea of what an administrative job in health care could offer. I figured – why not go against the grain a bit? Why not see what else is out there? So I spent eight weeks with a little yellow notepad and a ballpoint pen, trying to absorb every aspect of health care management I would encounter. From finance to operations to data analytics, my learning curve was intense. My projects were new and overwhelming. And unfortunately for me, my pure science course load in undergrad proved to be absolutely zero help. Every day in the office was different, and the variety of projects that I had was a true testament to that. To name only a couple, I was tasked to give suggestions of improvements to an oncology lab based on my observations, as well as to create an internal employee survey measuring employee satisfaction and engagement. I was working with real-time data, and important information that was of great use to my preceptors. It was a bit intimidating, determining the best way to utilize it all. What motivated me, though, was the trust my preceptors had in me to get the job done, despite me being an intern with so much to learn. Throughout each of my projects, I was expected to know exactly what was expected of me, but to also know what my limits were and when to ask for help. I was called on to report back the results I found, making me feel like an integral part of the discussions that took place in that second-floor conference room. And most importantly, I was held accountable for ensuring that my output was my absolute best effort. Each day brought a different challenge, but I had the guidance and the support I needed to meet each one. So while I came into my internship not really knowing what to expect, I can happily say that this summer turned out to be an incredibly rewarding experience for me. 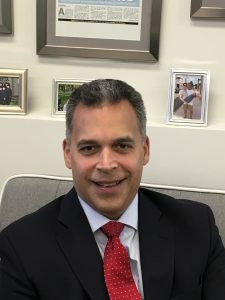 I not only learned a lot about Northwell, and their commitment to their patients and employees, but I also learned a lot about myself, and about what my capabilities are. This summer I had the great opportunity to be a part of a team, a team that needed me just as much as I needed them. For those of you wondering where I stand in terms of my career plans now, the administrative side of healthcare has definitely caught my eye. The hustle and bustle that occurs behind the scenes, and not on a care facility’s main floors is an experience like no other. But overall, I have come to learn that there is definitely a career for me in healthcare, regardless of what path I will ultimately decide to take. Submit your resume to become a Summer Associate in the 2018 Healthcare Management Program Internship. I got the call I would be working in the Big Apple this summer in the middle of my finance class. Filled with excitement, I was practically squirming the rest of class. Needless to say, I didn’t do too well on the quiz that day. Four months later, I was on the way to my dream city for the summer to work at Northwell Health in the Cardiothoracic Surgery and Cardiology Service Line. I’ve always had this obsession with living in a big city. Maybe it’s because I grew up in a boring suburb or maybe I just love breathing sub-par air. Regardless, I was made for New York. Northwell Health was the perfect internship for me. However, Healthcare Administration hasn’t always been my path. The majority of college was spent preparing for medical school. This let me dip my toes in the water and see if this is the right choice for me. Day 1 at North Shore University Hospital rolls around and it was a whirlwind. For starters, my boss LOVES the stairs and my body does not love the stairs. The campus was and still is, so incredible. Almost a tiny city filled with thousands of employees and patients surrounded by world-class healthcare. From the get-go we had assignments. Whether it was data analytics, operations or marketing, we were pushed out of our comfort zone. I literally spent a week staring at excel trying to figure out that beast. The panic of not knowing a single thing about what I was doing began to hit. I sat down with one of the Management Associate Program associates and she told me you’re not growing if you’re comfortable. So I kept on trucking and utilized all the people around me. We were given work that actually means something and can benefit the service line, which not a lot of interns at other companies can say. 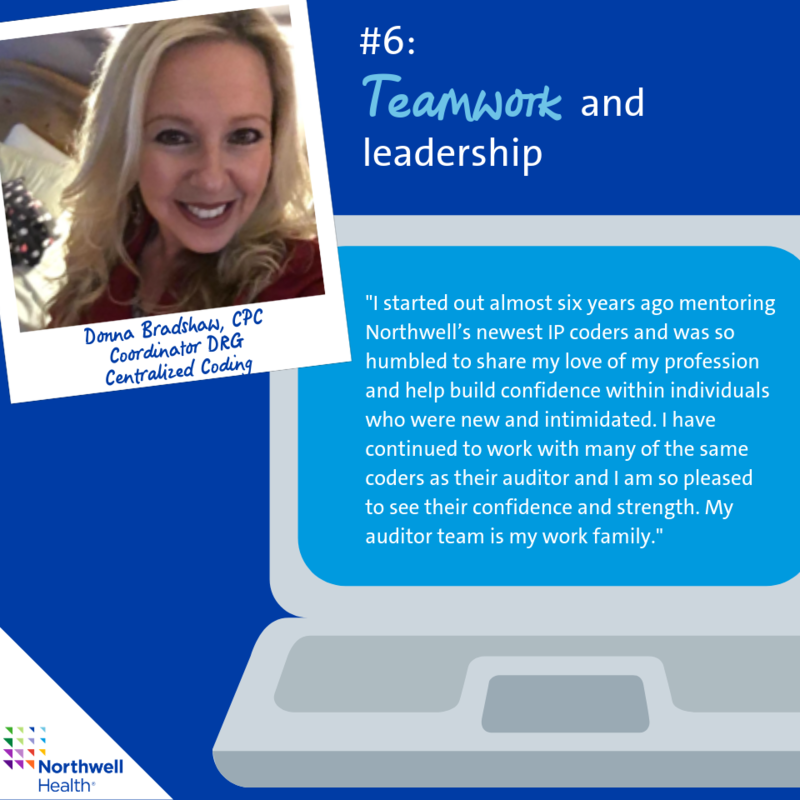 My Northwell Health experience has been one for the books. Aside from learning perhaps more information than I have in the classroom, the other interns have pushed the experience from great to incredible. A group of us, the out of state “commuters”, have gotten so close. From after work dinner, Broadway shows, happy hour and so much more, we became closer than ever. I think that is going to be the hardest part, going back to our respective universities and not seeing each other for an absurd amount of time. You know us millennials though; we will stay in touch through one of our 20 social media platforms. Lastly, I am so thankful I had such supportive preceptors pushing me to grow and challenging me, but most importantly helping me learn. Whether my journey with Northwell Health continues or I end up someplace else, I’ll look back and know I was Made for this. Update: Jimmy has been offered and accepted a full-time position at Northwell Health after he graduates from the University of Texas in May.